Michael K. Tanenhaus is the Beverly Petterson Bishop and Charles W. Bishop Professor in Brain and Cognitive Sciences at the University of Rochester. He earned his Ph.D. from Columbia University in 1978. After being an Assistant and Associate professor at Wayne State University, he joined the faculty at the University of Rochester in 1983. He has received numerous honors for his research on language processing. 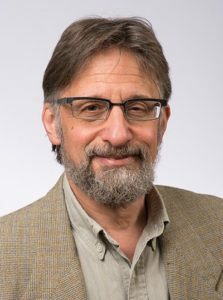 He is an elected member of the American Academy of Arts and Sciences, a fellow of the Cognitive Science Society, and the 2018 recipient of the David E. Rumelhart Prize. Tanenhaus has made numerous lasting contributions to the field of psycholinguistics in particular, and to the discipline of cognitive science in general. His research program has transformed the field of language processing from embracing modular feedforward information-processing models that strictly limit context effects to instead embracing distributed interactive models that allow a wide variety of context effects. The breadth of Tanenhaus’s thinking, combined with his uncanny experimental skills, have inspired a new generation of researchers to take a fresh look at what it means to communicate by language. In addition to his own individual scientific influence, his prodigious and expert training of graduate students has produced a small army of cognitive scientists with their own influential research programs all around the nation. Tanenhaus’s contributions to cognitive science were significant even early in his career. He is known as the co-discoverer (along with Swinney, 1979) of the ‘parallel access’ effect in the recognition of spoken words (Tanenhaus et al., 1979). In this now classic study, he and his colleagues demonstrated that when people hear a word with two common meanings (e.g., watch), both meanings are mentally available for a fraction of a second, regardless of the sentential context. Rather than assume this result was evidence for an architectural limitation in the human language processing system, Tanenhaus endeavored to explore the temporal dynamics of why some context effects manifest as delayed or weak, and others manifest as immediate or strong. In eye tracking-reading experiments, his research team showed that syntactic processing is immediately influenced by lexical information, semantic information, and discourse context. In the mid-1990s, his research program adapted an eye-tracking methodology for circumstances where participants follow spoken instructions in real-time (Tanenhaus et al., 1995). This methodology became known as the visual world paradigm in psycholinguistics, and has revealed that a wide variety of visual and situational contexts can immediately influence word recognition, pronoun resolution, and syntactic processing. Thus, not only is language processing generally understood to involve distributed interactive processing among different types of linguistic information, due in large part to Tanenhaus’s research program, but cognition now generally understood to involve distributed interaction among linguistic, perceptual, and cognitive processes. * FABBS would like to thank Dr. Spivey and Dr. Trueswell for nominating Dr. Tanenhaus for this honor and for leading the effort. Would you like to honor Dr. Tanenhaus? It’s not too late to have your name added to the list of donors! You can make your donation to Dr. Tanenhaus’ In Honor Of… campaign at anytime.